The year 2013 marked an incredible one for spaceflight, with space agencies around the world making giant leaps in their own exploration of the solar system, while NASA welcomed the addition of a new commercial cargo ship to its list of supplies for the International Space Station. Also this year, Virgin Galactic and other private spaceflight companies made strides in their work to make space tourist flights a reality, while one Canadian astronaut became a social media mega-star by showing what life is truly like in space. When China's Chang'3 spacecraft landed on the moon on Dec. 14, it marked the first soft lunar landing in 37 years and the country's first-ever successful touchdown on an extraterrestrial surface. Chang'e 3 also delivered the rover Yutu ("Jade Rabbit") to the lunar surface for a three-month exploration mission. In another milestone for China, three astronauts aboard Shenzhou 10 docked with a small space station prototype Tiangong 1 in June, paving the way for the country to achieve its goal of making a larger space station in the future, analysts say. Both dragons and swans visited the International Space Station in 2013, courtesy of two private companies that have multimillion-dollar agreements with NASA to send cargo to the orbiting complex. The Dulles, Va.-based Orbital Sciences Corp. made its first demonstration flight in September with its Cygnus spacecraft and Antares rocket, marking a major leap forward for commercial spaceflight. Orbital Sciences has a $1.9 billion contract for eight cargo delivery mission to the space station for NASA using its Antares rockets and Cygnus spacecraft. The Antares booster launched its first test flight from NASA's Wallops Flight Facility on Wallops Island, Va., in April, setting the stage for the September Cygnus debut. Orbital is now slated to launch its first official cargo mission to the station on no earlier than Jan. 7 after a a delay due to an unrelated space station cooling system malfunction. The first Cygnus commercial cargo spacecraft built by Orbital Sciences Corp. is seen here attached to the International Space Station's Harmony node, after arriving at the station on Sept. 29, 2013. Meanwhile, the Hawthorne, Calif.-based Space Exploration Technologies Corp. — known better as SpaceX — launched its own unmanned Dragon space capsule on a cargo mission to the space station March this year. It was the second of 12 cargo missions to the station for NASA under a $1.6 billion deal. SpaceX also test flew a new version of its workhorse Falcon 9 rocket, made its first west coast launch from California's Vandenberg Air Force Base, and made advances in reusable rocket technology using its Grasshopper prototype. The company's manned version of the Dragon spacecraft also passed key design reviews in 2013. SpaceX's next launch of a Falcon 9 is set for Jan. 3 from the Cape Canaveral Air Force Station in Florida carrying the Thaicom 6 communications satellite. An artist's illustration of India's Mars Orbiter Mission spacecraft, called Mangalyaan, launching in November 2013. India's space program went interplanetary in 2013, when the country launched its first mission to Mars. The $73.5 million Mars Orbiter Mission (MOM) thundered into space successfully in November on its 300-day journey. Engineers initially struggled with an engine problem in the days following the launch, but MOM is now winging its way over on a mission to search for elusive methane on Mars, and to test long-distance communications and space technology. Meanwhile, NASA's newest robotic mission to Mars looked like it would be pushed back by the government shutdown, but the agency received a special exemption to launch MAVEN on time in mid-November. The $650 million MAVEN mission to Mars — the name is short for Mars Atmosphere and Volatile Evolution — will be a communications relay for the Curiosity and Opportunity rovers on the surface while also probing the origins of Mars' atmosphere from orbit. A camera mounted on Virgin Galactic's SpaceShipTwo shows shows the view behind the spacecraft as it took its second powered test flight over the Mojave Air and Space Port on Sept. 5, 2013. Space tourism took a huge leap closer to reality in 2013, when Virgin Galactic made two powered test flights of SpaceShipTwo. Launching from California's Mojave Air and Space Port, the private company's spacecraft zoomed faster than the speed of sound, high above the desert. 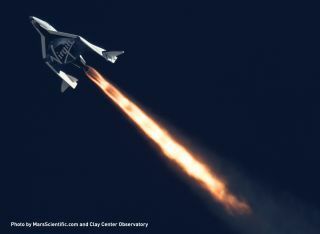 On the second flight, pilots also tested the feathered re-entry system that will bring SpaceShipTwo safely back to Earth after a trip into suborbital space. Britist billionaire Sir Richard Branson, who owns the company, plans to be on the first spaceflight with his family before commercial flights begin in 2014. SpaceShipTwo and WhiteKnightTwo are an evolution of the SpaceShipOne and WhiteKnight vehicles built by aerospace veteran Burt Rutan and his Mojave, Calif.-based firm Scaled Composites to win the $10 million X Prize for reusable private spaceflight. Chris Hadfield became a space star, as he found time to hobnob with Star Trek stars and create a David Bowie music video tribute in between running an extremely productive science mission on Expedition 35 aboard the International Space Station. The Canadian astronaut commanded the expedition while posting daily tweets, videos and pictures about life in space, charming people all over the world. Shortly after landing in May, Hadfield announced his retirement from the astronaut corps — but instead of relaxing, he stepped on the accelerator. He released a book and is now on a multicountry tour that, again, is attracting crowds and celebrities (most recently, in London, physicist Stephen Hawking). Then, in fall 2014, Hadfield will start teaching at the University of Waterloo in Ontario, Canada.